Education Loan Task Force (ELTF) has been receiving lot of mails daily seeking clarifications. Based on the type of questions, we provide the correct information for the benefit of students and parents. 01. In some areas, banks allocate themselves few wards for grant of education loans. Is it right? There is no service area approach for granting education loans. The students can approach any bank in their area. Either they can submit applications directly or online through their websites. Banks cannot refuse to accept the applications on the grounds of ward allotment. If some of the banks insist on 'service area' concept, the students can complain to the concerned Regional Manager and the Chairman of the Bank. 02. After submission of applications, is there any time limit for the banks to process and communicate decision? The students are entitled to receive acknowledgement from the banks after submission of applications. The acknowledgement should contain date and time of receipt of the application and the signature of any authorised official of the bank. The banks should process the application and communicate the sanction or refusal within 15 to 30 days. The refusal has to be approved by higher authority of the bank. The students are entitled to get a letter stating the reasons for refusal. 03. Some banks mention as IBA Scheme and Non-IBA Scheme. What is the difference? In consultation with the Government of India, Indian Banks Association (IBA) has forumulated a scheme for granting education loan to students. All the Public Sector Banks have accepted this Scheme suggested by IBA. The latest IBA scheme is available in this link. If the students are not eligible under IBA scheme, depending on individual cases, banks come forwrd to help the students with education loan under their own terms and conditions. Even most of the private banks have not been following the IBA scheme. They also grant under their own terms. These loans are known as Non IBA scheme. The security concessions, interest subsidy, long repayment schedules may not be available under Non IBA Scheme. 04. Can the students joining the colleges through Management quota, avail the education loan from banks? It would be in order for banks to consider a meritorious student (who qualifies for a seat under merit quota) eligible for loan under this scheme even if the student chooses to pursue a course under Management Quota. IBA has given permission to the individual banks to formulate their own scheme. Generally, banks do not prefer to grant education loans under IBA scheme to the students who join under the Management quot directly, without going through counselling route or merit route. When the student applies under merit channel and gets an allotment of seat or college, he can refuse the allotment on the grounds of (a) not getting the course which he wanted or (b) not getting the college which he opted. If he refuses the allotment and then joins the course of his choice under Management quota, he is eligible for loan under IBA scheme. Instead if the student directly joins the management quota, then banks will not consider granting education loan under IBA scheme. 5. Who is eligible for interest subsidy? (c) The gross income of the parents / family should be less than Rs.4.50 lakhs. The students should submit income certificate signed by the competent authority appointed by the State Government. (d) The loan amount or part of the loan amount sanctioned on or after 1.4.2009 is eligible for interest subsidy. If the students are eligible for interest subsidy and if they submit the income certificate to the bank, then the students can get 100% interest subsidy till the moratorium period (One year after completion of study or six months after getting employment, whichever is earlier). The banks should not collect interest from the students till the end of moratorium period. The banks will claim from the Government. If any bank insists on the students to pay interest periodically as pre-condition to release the next instalment of fees, it is a violation of Government guidelines. The students can refuse to make interest payment and can complain to the Chairman of the Bank and to RBI. Even if the students are not eligible for interest subsidy, the students can opt to pay accrued interest later. In such cases, the banks will calculate interest and add the accrued interest along with principal and fix up EMI. The students can submit a letter to the Bank Manager to this effect. Bank cannot refuse to accept the request. If a loan amount of Rs.2,00,000 was sanctioned in 2008 to be disbursed @Rs.50,000/- each year and Rs.1,50,000/- was disbursed in 3 years after 1.4.2009, then this amount of Rs.1.50 lakh is also eligible for interest subsidy. The students can give a letter to the banks seeking interest subsidy. Interest subsidy is available only for one course either UG or PG. More than one person from the same family can avail interest subsidy. These rules apply only to loans sanctioned under IBA scheme. 06. 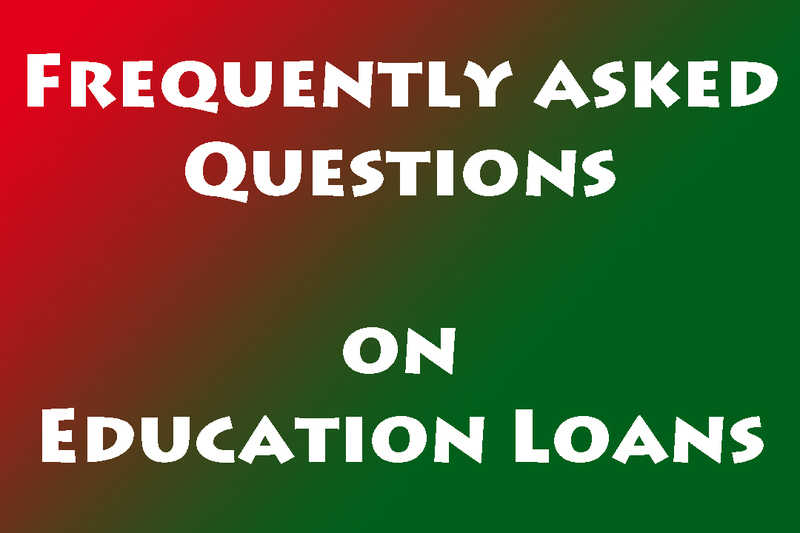 Can more than one person avail the education loan from the bank under IBA scheme? Will they be eligible for interest subsidy? More than one person can avail the education loan from the same family (same parents). In that case, the limits will be combined and the security norms will be applicable accordingly. If they avail loan under education loan under IBA scheme, all the brothers / sisters are also eligible for interest subsidy, subject to other conditions. 07. Some banks refuse to accept applications, if the marks are less than 60%. is it right? This is wrong. As long as the student got admitted under merit channel, irrespective of the marks, they are eligible for education loan under IBA scheme. Please also see the High Court Judgement posted in this site. 08. If we have grievance, how to take it forward? If the students have any grievance for violation of guidelines, harassment, etc., they can meet the concerned Regional Manager of the bank and submit a complaint. They can also submit a complaint to the Chairman of the concerned bank and also to RBI. Details are given in this site. 09. If the students want to avail education loan for foreign studies, what should we do? Banks do not grant eduction loan for medical courses in Russia, China and some other countries. The students completing these courses outside India may have difficulties in practising in India. They are not approved by Indian Medical Council. Besides, many of the students get admissions in institutions that are not approved by banks. Then they find it difficult to get bank loans. Even those who are completing higher education in foreign countries with bank loans find it difficult to get employment in India or anywhere. ELTF is getting lot of mails about the students getting into 'debt trap'. Banks are concerned with the employability and repayment capacity, after completion of foreign education. Hence, the students are requested to be more cautious while going for foreign education. Instead of looking for bank loans, they can explore scholarships to cover their expenses. Interest subsidy is also not available for education in foreign countries. 10. How to repay the bank loans? The repayment starts one year after completion of study or six months after getting employment, whichever is earlier. If the student is eligible for interest subsidy, banks will get the reimbursement from the Government. Banks will start applying interest after moratorium period. If the student is not eligible for interest subsidy, the accrued interest will be added to the Principal amount after the moratorium period. After the moratorium period, bank will fix EMI repayable within a maximum period of 10 years of 15 years, depending on the amount. Students can opt for 'telescopic' repayment schedule. That means, depending on the income, students can pay lower EMI in the initial period and higher EMI later. Students should insist on a longer repayment period, so that the loan does not become Non Performing Asset. 11. How to approach ELTF? If any guidance is needed on the issues, which are not discussed in this site, you can write to us at info@eltf.in with full details. We do not entertain 'tweet' type of messages. We do not entertain any phone calls. ELTF does not undertake to get loans. ELTF gives only guidance. The students and parents have to meet the Bank officials and discuss the loan proposal directly with them. If students and parents notice any violation of RBI / IBA guidelines, they have to bring it to the knowledge of REgional Managers and Branch Managers first. If they do not respond, they can report to ELTF through mail with full details, including the name of the bank, branch, the officials met, the problem, etc. If needed, ELTF will directly take up with Chairman of the Bank and with RBI for their attention. Before taking up the grievances with ELTF, students are advised to meet the branch manager and the regional manager for sorting out the grievances. 12. Can banks stop disbursing future instalments of fees, when the students keep 'arrears' of papers? Students write to us saying that the banks do not release the next instalment of fees, when they keep few arrears of papers. When the banks give finance, banks expect that the students should study well without any worries about money and pass the examinations with good marks. If the students, do not take the education seriously and keep arrears of papers, the students lose the employment opportunities, defeating the purpose of education loan. Naturally banks have every reason to show their concern when the students fail in some papers. Indian Banks Association in their circular No CE/210 dated 31st May 2012 sent to all banks has suggested as follows. (g) Where institutions permit students to keep terms, in case of failure in one or two subjects, banks could disburse subsequent instalments. If the Colleges permit the student to pursue the education in the next semester, not withstanding the arrears of one or two papers, IBA has suggested the banks to disburse the next instalment of fees. If the students are not permitted to go to the next semester / term, then banks will not release the instalment. If the students keep arrears, they can meet the branch manager along with the parents and give a letter of undertaking to the bank that the student would clear the arrears within the next semester. They can also request the bank to release the next instalment of fees. The student should keep up his assurance and clear all the arrears within the next semester. Generally banks will oblige, if the student keep arrears of one or two papers. When the students talk about their right of education loan and obligations of banks, they should remember their duties and obligations to the banks. The above guidelines are applicable only for loans under IBA scheme. If the banks consider the loan application under their own scheme (Non IBA Scheme) the above rules may not apply. The students have to check with respective banks. ELTF does not get loans or undertake get loans. ELTF provides only guidance to the students and parents. ELTF does not intervene with the procedures of individual banks.